Pali Wins Two Prestigious Technology Innovator Awards! 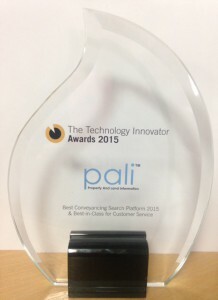 It’s a double whammy for Pali who have recently been awarded ‘Best Conveyancing Search Platform 2015’ and ‘Best-in-Class for Customer Service’ in the 2015 Technology Innovator Awards. In an incredibly short space of time, technology has almost completely transformed the way in which we do business. Just a few short years ago, businesses of all types placed an enormous emphasis on cultivating and maintaining human relationships, through client visits and invaluable face-time. However, today, while the value of these relationships cannot be downplayed, advances in technology have paved the way for global businesses to operate in a far a more efficient, timely and cost-effective manner. Technology has taken centre stage as a crucial component of any business and doors have been opened for businesses of all types, from SMEs to large multi-nationals to capitalise on easier access to international markets and streamlined processes. As the corporate world continues to evolve, the importance of technology and its role to play cannot be overstated. The 2015 Technology Innovator Awards highlight the individuals behind these ground-breaking developments, and through these awards, we have sought to ensure that we shine the spotlight only on those cutting edge individuals, departments and firms who, through their commitment, experience and willingness to explore and take advantages of the opportunities presented, are developing and sharing the technology that will continue to enhance and fundamentally alter the business world for the better for many years to come.